Mike Arrington is doing the next Core Values session at Bloggercon IV. I want to wish him well, and note the information from the Core Values session at Bloggercon III that I led, because I think that session was extraordinarily productive. In fact afterward, many people kindly said that they felt it was most useful and interesting, because they left with something tangible (the list) and they really liked that rather than me telling them what the values are I see online, or that I feel are important myself, I just asked questions, and let them come to the conclusions about the values they share and the controls they felt should exist to support those values. They appreciated the light touch guiding them to find and develop their own conclusions. Good luck Mike! I'm sure you'll take us to the next level. I hope the last sessions list is useful as a starting point. Broadcast and Audio Flags are provisions in Senate Bill 2686, up on Thursday. They are bad for users, bad for balanced copyright, bad for fair use, bad for innovation, and bad for new companies (including Dabble). This is about incumbent media companies fearing the internet, much like the RIAA in 2001, and trying to get the government to protect them against digital media, instead of working with it to create new business models. Call your Senator (there are some numbers below provided below in an except from an EFF email. I just called Senator Boxer's office (212 number is below, or SF: 415-403-0100) to register my opposition, and I noted that Boxer's office takes phone comment anonymously. Interesting. the flags to find a home of their own. excluding these provisions on Thursday. Okay, I'll let the Senator know. Thanks. Open space, in the camp conference style, requires some key elements to work well. I'm noticing after watching two different events develop that they may be missing what is important about Open Space. A couple of months ago, I attended a conference on the east coast. The organizer told me he wanted to do an Open Space day, the day after his event. That day arrived, he bailed, and there were six of us who actually attended. And he insisted that I go, even though I really have a lot of other things to do. The Open Space day was meant to brainstorm ways to organize Net Neutrality support. After the event, others who attended it suggested that Bar Camp a failure. Well.. I totally disagreed. They thought that somehow, calling an open day "Bar Camp" would make it happen. They had a wiki with about 22 names on it, and a stellar group of people slated to attend. They had great space, in a lovely lawfirm with wifi, and everything we might need. What they didn't have was a leader to organize the space. Although one person who attended in the middle of the event suggested that if things weren't working, he could vote with his feet. And he would if he wanted to do so. Though considering there were six people in the room, it sounded more like a threat: you don't do what I want to today, or I'll leave. So everyone started doing what he wanted. The point of course of "the law of two feet" is that you don't stay somewhere where you aren't learning. But that applies to Open Space where there are maybe say 100 people, and multiple rooms where you can move and not be disruptive, not six people where you are an integral part of deciding what is happening. But with such a little group, that misapplication of that particular Open Space principle further caused the day to deteriorate as a camp. What little emerging leadership was happening was killed right there, though he wasn't wiling to lead. He just wanted everyone to do things his way. Without a clear leader, supporting a basic framework for a day of sessions or some kind of plan, just didn't work. It wasn't the concept of Bar Camp that failed. It was a failure of the people proposing it and carrying it out. I know the Open Space day is happening, more due to the Identity list I'm on, than the event web pages. After there was discussion on the list, I asked about the lack of information supporting the Open Space day on the website, and Paul Trevithick and John Clippinger did add a little information about the day on the session page, to let people know it was even happening. However, I had suggested on the email list that they make a page for the attendees to show that they were attending and add the speakers to the schedule and speaker's page. They did not. The point I'm making is that I think people who do top down, broadcast style conferences are interested in what's happening with camps and Open Space, but they don't understand the dynamics of them or Open Space sensibility, and so in applying top down controls and information styles to their camps, they potentially harm the good that can come from the camp. And since the leaders of the camp are not traditional speakers, the organizers of the larger top down conference probably think they don't need to list the camp or Open Space leaders as speakers on the larger conference site because the camp facilitators aren't speaking in a traditional way. But this is not true. Listing them is critical to fostering the process of the day. For example, we know from past successful camps that having a page where attendees say they are coming is key, because the agenda is made the day of the camp. Therefore, people choose to attend because other interesting people will be in the room, not based upon pre-arranged sessions. Secondly, the leaders of the day are key. They have to balance the right amount of support for the Open Space while leading just a little so that attendees make the agenda the morning of, and that things are pulled together at the end of the day. People choose to come, or not, based on who will be leading. Currently, the leaders of the identity Open Space day are not on Harvard'sthe speaker list, nor does Harvard's the schedule note them, even though speakers the previous two days are listed on the schedule with their corresponding sessions. I believe the Open Space day will go well due to Kaliya's and Jon's attention, because at least Kaliya has done this before (I don't know about Jon's work with Open Space) and understands well the dynamic needed to make this kind of day work. But the fact that the Open Space day at Harvard's Identity Conference has not been adequately supported with proper information at the event website shows the lack of respect for the dynamics of this kind of event. Since there is no sign up page, they will likely have a vastly diminished attendance compared to the broadcast conference days. A signup page might have actually brought in more people if they'd opened it up to more than just the attendees the first two days. In fact, bringing in new people to understand Identity in technology development is very important and this is a missed opportunity as well. I do wish them good luck with it, but I wish that the Paul and John, with control of the conference website, understood better why what they have done with both the attendees of the open space day and the leaders may not help the day succeed as well as it should have. They can't blame the camp style for this, but rather themselves. If they day succeeds, it will be in spite of these problems, and due to Jon's and Kaliya's personal networking and leadership for the day. Internet Fast Lane Plan Worries Small Companies by Michelle Kessler. Basically, it's that part of AT&T's and the other telco's new internet pricing plan, where they would charge the provider of the material to send their material through to subscribers, that is the problem. As I've said before, we didn't make the internet to turn it back into cable tv. i kind of wonder if this still stands this way, two years later. things have shifted a lot over this period. frankly the new yahoo is just out innovating google for now..
attendant stats that back those objective understandings up. front again as an innovator. what changes a company from one category to another? these aren't even defined, and are totally in the realm of folklore..
and simplistic impressions than anything all that real. people laugh a lot. so there must be something there. You know, the kind of cable TV where big entertainment companies pay off cable companies to get their channels on your set top box? Congress didn't accept it, so net neutrality lost. So we are keeping the system that started a year ago. It's the one that will make the internet like Cable TV. It's critical to innovation, our companies (mine is Dabble.com) and to freedom of speech that we have a neutral net, where anything can move across it, where there is no fee to get some piece of information through to someone who wants to see it. This isn't about tiered pricing. This is about who's packets paid the telco's fees. This is about Hollywood keeping us from speaking, because if I'm watching my friend's video, I'm not watching Disney. Hollywood stands to benefit the most, after the telco's who charge the fees. And Disney can afford to pay off the telcos to pass through their info, but my friends can't. All the talk this past week about Jaron Lainer's essay, The Hazards of the New Online Collectivism is another one of those 'or' things that keeps coming up around the internet. (Or Internet with a capital 'I', if the NY Times is your style guide.) As an aside, Sam Klein of Wikipedia at the on Monday, asked everyone to please (smile) stop calling it "the wikipedia." It's just "wikipedia." Ok, back to Wikipedia. So Wikipedia is not a replacement for Encyclopedia Britiannica. Instead, you use one for some things (I use wikipedia for finding links because Google's search results for many kinds of items are too polluted and unhelpful) and a reference like Britannica (well, not Britannica, but I have lots of other traditional old style references) for things that those top down, traditional reference sources cover better. We use reporting from professional journalists for reporting, access to places individuals can't get into, and some kinds of news, and blog posts for voice, commentary, and some kinds of news and reporting. We use remix video for humor, smaller stories and short form video, and TV for long form, high production video. We use Flickr for the stream of photo images that comes from our friends and for some kinds of reporting, and we use Getty for.. well.. they are hard to use. So we don't buy a lot from them. Wikis are used for the collection of information around a topic or event, blogs are used for voice and commentary. 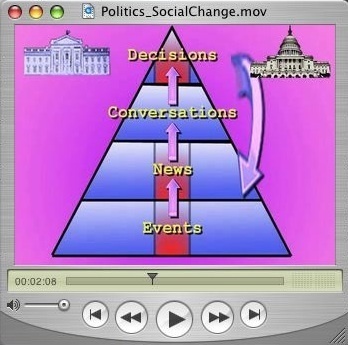 Collective tools are used for collective action, and voice tools are used for voice. The thing is there are choices, based on purpose, goal, need, process and style. And the choices are based on nuances that the arguments above cannot reasonable reduce to an 'either or' situation. A single thing is not meant to work in all instances. And the beauty of the internet combined with information technology is that together they give us lots of choices. Both for production and consumption. I think the rest of the folks who responded to Lanier's essay did a great job of discussing the subtler ideas and arguments, so I'll let those stand as they were terrific. There is no need to restate the idea that some of Lanier's criticisms do not necessarily apply to Wikipedia, or that some others do apply, in specific contexts, but that wikipedia is supposed to function the way that it does. I just wanted to point out that online, as everywhere else in life, we make choices, and the idea is to choose the best thing for the circumstances, not to expect that all things will work in all circumstances. The internet is no exception. First, watch the video. And then the other video. And this other video. Yah. It's worth it. Then, check out David Isenberg's most terrific eTel talk about your freedom to connect. And check out Save the Internet. They have tons of great information. Another way of looking at this issue of net neutrality is... remember the old Highway system. Where El Camino Real on the peninsula in the Bay Area used to be a toll road, where you would not get mugged and the road was nice and fast, but it was expensive. And the Alameda (parallel to ECR) was the slow road, which wasn't taken care of, where you would likely be ambushed and was free? Well, that's what the telcos would like us to see when they talk about two tiers. And think about what that kind of road system does to the economy of information? It's not very democratic is it? This isn't just a small or large bag of potato chips. Or dial up and broadband. It's about whether we support basic services for all people to get information. Cause if you are on dialup, you are missing much that is useful and interesting about the internet. Secondly, the part that's different about the types of information that would be available in the slow cheap road verses the fast expensive road (dialup verses high-speed bandwidth) is that the packets would be treated differently. The perverse part of the telco's proposal is that packets of certain types (VOIP and video, for example) that paid an additional toll, would get to you faster than those that didn't pay. What that means is is that the Hollywood and bit content producers would have the edge over the average person who wants to get a message out. So if you have a fast connection but joe blogger didn't pay, well, sorry, those packets won't get to you quickly. Instead, even though the user paid for faster service, they would not get all packets at the same speed. The content maker who didn't pay would have their packets come through slowly. And of course, the slow speed service buyer, who asked for a video from the content maker who didn't pay the toll would never see that video, it would be so slow.